This week's cold weather isn't just challenging for people. Dogs accustomed to blowing off steam in the backyard are now penned up inside — driving their owners bonkers. We talked to some dog experts around the state, who gave us their best advice on how to keep dogs happy and healthy during this rough weather. To persuade reluctant dogs to go outside at all, Maureen Haggerty, owner of The Canine Coach in Minneapolis, recommends making the yard slightly more comfortable for dogs to find a place that is sheltered from the wind. An area between a shrub and a house can be perfect for smaller dogs. 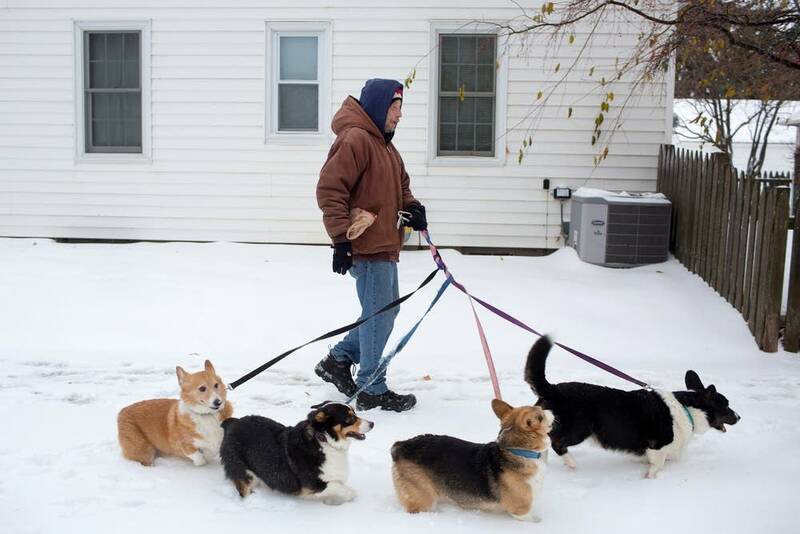 "Most dog owners, if they do have a yard, they do shovel a path, because some dogs don't like to squat and then feel the snow," Haggerty said. For those who still want to take their dogs along for outdoor activities in the winter, dog experts recommend checking with your veterinarian to see if your dog can handle extended treks in cold weather. Different breeds will deal differently with the cold. A husky is made for cold weather, although even a husky can get frostbite or otherwise injured when temperatures drop very low. But short-haired dogs, like Haggerty's Dobermans, have more trouble staying warm. To keep them warm, Haggerty outfits them with coats and neck warmers to cover their ears. She also recommends a salve called Musher's Secret, which can protect their paws from ice and road salt, both of which can be painful or even toxic for dogs. If her dogs give her any indication that they are uncomfortably cold, Haggerty will return home. Although dogs may not always appreciate having paw-shaped plastic Velcroed to their feet, Tabatha Patterson, owner of Rock Star Dog Walking and Pet Sitting, said getting a dog the appropriate clothes can go a long way in making him or her more comfortable during the winter. "Just getting them the proper gear to wear outside makes all the difference in the world: hoods, coats, boots — just like people," Patterson said. "Dress your dogs properly so they can still get the exercise they need during the winter." When temperatures drop into a deep cold like the one that's enveloped the state this week, Patterson said her dog walkers spend more time indoors with their clients. "We do a quick let-out, enough for the dog to do his or her business," Patterson said. "Then we spend the rest of the time playing in the house, playing fetch; if we're walking at apartments downtown, we walk the hallways for a half-hour, so the dogs get some exercise." Other dog owners take advantage of indoor daycare and play areas. Ralph Bernstein, owner of Downtown Dogs in Minneapolis, said his business sees a big uptick when weather gets cold. "A dog that wants to run around, but can't, will make an owner a little crazy," Bernstein said. "Our day care numbers tend to shoot up in times like we've been having recently, where it's just so brutally cold because people want to get their dogs some exercise, but it's too cold for a dog to be outside." It's not necessary to overthink how your dog copes with winter, Bernstein said. "If it's cold enough for the owner to be saying, 'It's too cold to be outside for me,' the dog is probably saying the same thing."